A solid kingdom simulator that asks just a little too much of gamers. Last week, I reviewed the attic-dwelling, miniature railway pleasures of My Railway HD, and it seems like there's a new micro-simulation released on the App Store every week. Next up is Enchanted Realm, a game that has garnered thousands of 5 star ratings on the App Store over the last week, surely making it the greatest mobile game anyone could hope for. Well, we'll see about that. 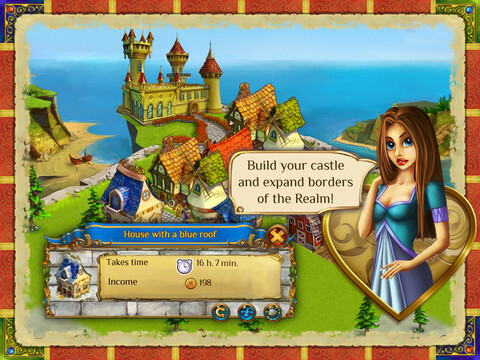 It's a game that absorbs the established tropes of the mobile simulation genre without blinking: you'll need to tap on coins and shops to gather the money you've created, drag buildings around the screen until they land on a nice green spot, and gradually expand your empire while balancing the wants and needs of your kingdom's residents. You'll need to invest in industry to keep a healthy economy flowing. Once the game's brief tutorial has brought you up to speed, it's not long before you're faced with a extensive shopping list of quests: expand the housing of the village, plant new crop types, repair damaged buildings, and so on. Obviously, absolutely none of this is designed to enhance your enjoyment of the game, simply to deplete your starting funds and drive you to the hell of the in-app purchase store, but we haven't called any number of games out on that yet, so we won't start now and it clearly doesn't bother an awful lot of gamers. Here's one thing a game can do that's guaranteed to make me frown and get angry though. 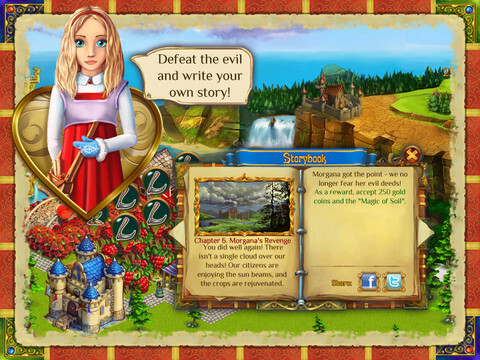 Not three minutes into Enchanted Realm, you're asked to rate the game five stars to both receive a reward and to remove an irritating story icon from the screen. It's a kick in the teeth to gamers and hugely disrespectful to the development community. If Apple won't call developers and publishers out on this awful practice, I will. Let it be so noted. "Rate this game 5 stars too!" Grumbling aside, there's plenty that I really do like about Enchanted Realm. 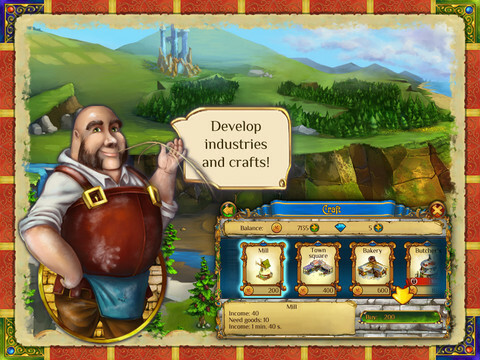 The selection of building types is generous, and no two gamers will have the same kingdom after a few hours of play. The game's also nicely animated and (ignoring the rating-begging quest), there's never a shortage of creative missions prompts that will help you keep your town expanding nicely. Almost everything can be customized and upgraded, so a more sparkling version of your castle will increase yields and gold income, while the cottages of your realm can be artfully decorated with various types of flowerbeds. Flags and gazebos can also be planted and crafted to make your village unique. There's decent variety in the building types and expansion options. Creating buildings will deplete your energy bar which either restores over time or, wait for it, can be topped up sooner if you buy more energy from the App Store. Likewise, extra currency or tokens that speed up construction and growth can also be purchased. Come to Enchanted Realm expecting not a revolution in simulation gaming, just an exceptionally well put together one that won't leave you starved of things to do any time soon. If you're a fan of these sorts of games, and you don't care about the demands of in-app purchases, the stop-and-start nature of progression won't bother you at all. Just try to resist the lure of the 5 star rating for everyone's sake. What's Hot: A wide variety of buildings, and the ability to create a truly unique kingdom of your own. What's Not: In the greater scheme of things, this really is just another kingdom sim. The rating begging menace also has to stop.